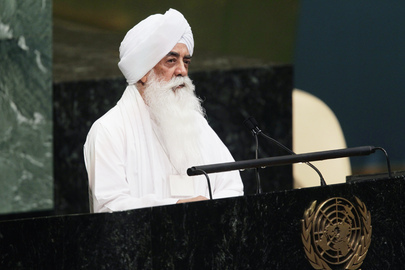 Bhai Sahib Mohinder Singh Ahluwalia was created a knight by the Holy Father Pope Benedict XVI in recognition of his dedicated work for Roman Catholic Sikh relations and for his enthusiastic commitment to working for peace among people of all faiths. It is the first time in history that a Sikh was honoured with The Pontifical Order of Knighthood of St Gregory. An award granted in recognition of an individual’s pre-eminent service to their faith, community, or the work of the Holy See on a local, national and international level. The Papal Order of Saint Gregory was originally founded by Pope Gregory XVI in 1831 and reformed by Pope Saint Pius in 1905. 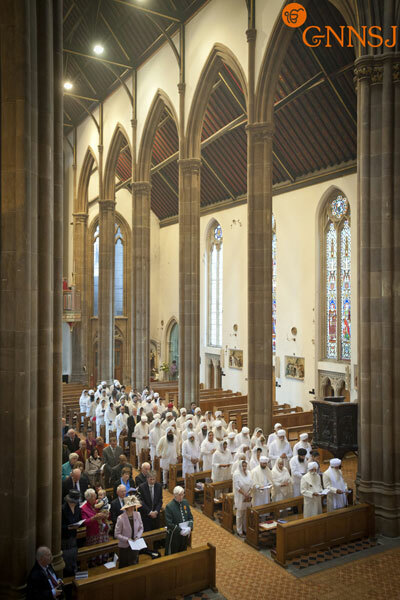 The ceremony was held on Sunday 22nd April at Saint Chad’s Cathedral in Birmingham and led by The Most Reverend Bernard Longley, Archbishop of Birmingham. The Order of St Gregory is one of five Pontifical orders of Knighthood in the Catholic Church and is usually bestowed on Catholics. On rare occasions the Order is also conferred on non-Catholics in recognition of meritorious service to the Church and exceptional example set in one’s own community or country. More than 100 Sikhs fromBirmingham,London, Leeds, and some who had come fromKenya,Canada andIndia were present in StChad’s Cathedral for this unique and ground-breaking event in inter-faith relations involving the Catholic Church and the Sikh faith. 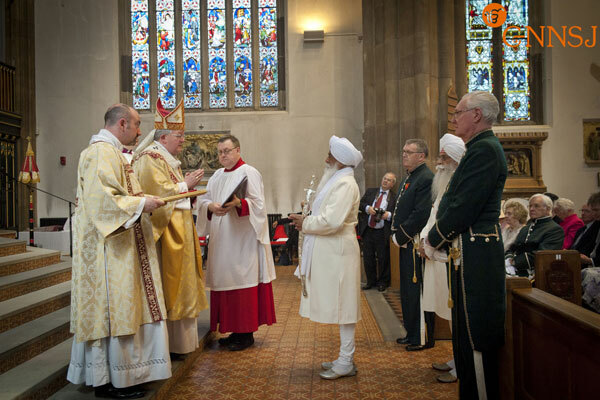 The occasion brought together Roman Catholic and Sikh devotees in hymns of praise from both traditions; something unique in a Cathedral service. Onlookers witnessed a historic event unfold for both Catholics and Sikhs. On completion of the ceremony the Sikh community’s jubilation call “Bole so Nihal” echoed in the vast Cathedral depicting a real victory for interfaith collaboration. Commenting on the momentous event, the Most Reverend Bernard Longley, Archbishop of Birmingham said:“Today I have been very grateful to the Holy See to bestow upon Bhai Sahib Bhai Mohinder Singh, one of the faith leaders in the City of Birmingham and spiritual leader to many Sikhs across the globe, with the honour of the Papal knighthood and I am grateful it is in recognition for the contribution he has made to Sikh – Catholic relations, not only here in Birmingham but in many other places. The Archbishop continued: “I believe that it is the first time that a Papal Honour has been bestowed in this way on a spiritual leader from within the Sikh community. It represents the Holy Father’s recognition of Bhai Sahib’s deeply held desire for fruitful and lasting relations between Sikhs and Catholics and opportunities to witness together. “We recall Bhai Sahib’s presence inAssisifor the international meetings of faith leaders at the invitation of Blessed Pope John Paul II and of Pope Benedict – and I am sure that he will long remember being present with Mandla Ji in St Peter’s Square at the funeral of Blessed John Paul II during April 2005”. Bhai Sahib’s engagement with the interfaith arena alongside the Pontifical Council has also included proactive participation with the Elijah Board of World’s Religious Leaders, Council for a Parliament of the World’s Religions, European Council of Religious Leaders, Religions for Peace (International Trustee), Tony Blair Faith Foundation, West Midlands Faith Forum, Birmingham Faith Leaders GroupBirminghamFaiths Roundtable. In recent years he has supported Post-Doctoral Research on Religion, Civil Society and the United Nations and also supportedReligions & PeaceBuilding. A visionary leader, Bhai Sahib was the first to celebrate The Global Interfaith Harmony Week in the UK; the first British Sikh to receive the prestigious title of “Bhai Sahib” from the highest Sikh authority Sri Akal Takhat Sahib in India; first to present a Siri Sahib (3 foot long Kirpan) honouring his significant services to the Catholic Church to His Holiness Blessed Pope John Paul II in May 2000. In October 2011 on the 25th Anniversary of the World Day of Prayer for Peace Bhai Sahib was allowed to meet the Pontiff whilst carrying his Siri Sahib that was presented to him at the Akal Takat in 2010. This signified a remarkable gesture showing the Church’s understanding of the significance and importance of the Siri Sahib (Kirpan) as one of the five Kakar and Dastar (turban) to a Sikh. Bhai Sahib in all humility said: “First and foremost I must thank God for making me worthy of such an award. I must also thank the Founders of GNNSJ, Pujey Baba Ji and Bhai Sahib Bhai Norang Singh Ji and the Sikh sangat on whose behalf I received this award. Furthermore, I must express my gratitude to The Holy Father Pope Benedict XVI for bestowing this accolade upon me and The Most Reverend Bernard Longley, Archbishop of Birmingham for the Investiture Mass. Read sermon from Bernard Longley Archbishop of Birmingham by clicking here. View and download photos from the ceremony by clicking here. Guru Nanak Nishkam Sewak Jatha (GNNSJ) is a multi-faceted, faith based Organisation practising and propagating the Sikh Dharam (faith) in the name of Guru Nanak Dev Ji (1469-1539). It has been involved in selfless intrafaith work in Kenya and India informally since 1950, and formally in the UK since 1978 as a registered Charity through five centres for excellence in the inner-city depressed area of Handsworth, Birmingham, where its Headquarters are based. GNNSJ also has sister organisations in Leeds and London (UK); as well as in Kericho (Kenya) and Delhi / Amritsar (India). Significant achievements have been made by GNNSJ in the conservation and restoration of historical Sikh shrines. Chaired by Bhai Sahib (DR) Bhai Mohinder Singh Ji who holds two honorary degrees from the city’s universities, and aims to serve and uplift society through the practice of core values – nishkamta, or the spirit of selflessness, being one of them. Inspired by spirituality, the GNNSJ has generated a flourishing culture of volunteering, which has contributed immensely to transform its visionary projects into a reality. For his services to religious faith propagation, community service, education and research, Bhai Sahib has been awarded two Honorary Doctorates from Birmingham’s Universities. He is passionate about values-based education and is the Patron of the Nishkam Primary School which opened in September 2011. Trustee of Anandpur Sahib Foundation. Chairman, for 10 years, since 2002, of the British Sikh Consultative Forum (BSCF) representing some 80 Gurudwaras and Sikh organisations in the UK, striving for intrafaith and interfaith community cohesion and engagement with the UK Government’s Department for Communities and Local Government (DCLG). International Trustee of Religions for Peace (International) the largest international coalition of representatives from the world’s religions dedicated to promoting peace in more than 70 countries. Member of the Elijah Board of World’s Religious Leaders (EBRL). Hosted conference in 2007 in Amritsar, India. Member of the European Council of Religious Leaders (ECRL). Hosted conference in 2007 at Nishkam Centre. Member of Fetzer Institute’s Advisory Council on World Religious and Spiritualities. Member of Tony Blair Faith Foundation’s Religious Advisory Council. Executive Member of Religions for Peace (UK). Supporter of United Religions Initiative (UK). Trustee and Chair of the Museum of World Religions (MWR (UK)) working group. Supporter of the Council for Parliament of the World’s Religions (CPWR), Chicago, USA. Supporter of Globalisation for the Common Good, promoting an ethical, moral and spiritual vision of globalisation. Hosted conference in 2005 in Kericho, Kenya. Supporter of the Goldin Institute, working towards building grassroots partnerships for global change. Hosted conference in 2005 in Amritsar, India. Member of Department for International Development (DfID’s) Faith Working Group. Supporter of Jubilee Debt Campaign since its inception. Participant in Shared Act of Reflection and Commitment by the faith communities of the UK, 2000 and participant in World Peace Prayer, Assisi, 2002 upon the invitation of His Holiness the late John Paul II. Patron of the Divine Onkar Mission, UK, a charity reaching out to people in some of the most remote parts of India. Trustee of Birmingham Citizens, a Social Action organisation. Patron of Sikh Mental Health and Wellbeing Trust. Executive member of West Midlands Faith Forum. Member of Birmingham Faith Leaders Group since its inception in 2002.